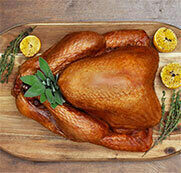 These flavours are best for smaller size turkeys in the 10 to 14 lb (5 to 7 kg) category. Place turkey on rack in roasting pan. Season inside of turkey cavity with salt and pepper. Tuck onions and ginger into cavity and tie drumsticks. Tuck wings under breast. In a bowl, whisk together sesame oil, soy sauce, garlic and ginger. Brush about half all over turkey. Whisk together broth, vinegar and miso paste; pour into bottom of roasting pan. 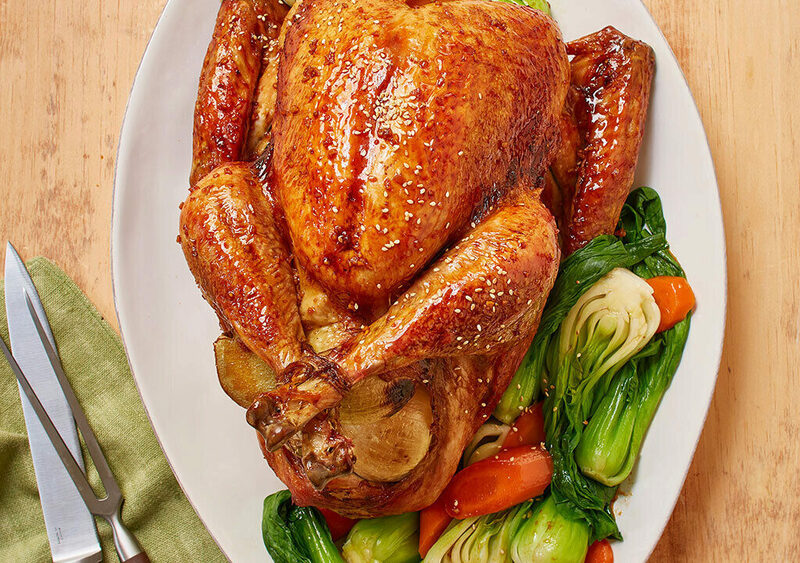 Roast turkey in preheated 325 F (160 C) oven for 1 1/2 hours and baste with remaining sesame oil mixture. Roast for about 1 1/2 hours, occasionally basting with pan juices. Insert thermometer into area between thigh and drumstick and once temperature reaches 175 F (71 C) remove turkey. Tent with foil and let stand for 20 minutes before carving. Strain pan juices. Sprinkle with sesame seeds, if using and serve with pan juices. If turkey has reached a perfect golden colour before reaching temperature, simply tent the turkey with foil in the oven. Serve up the turkey with some wasabi for an extra kick to each serving.